This week, the Global Health Office blog is going to get real scientific. So scientific, in fact, that I feel like I’m writing a paper for class (there are even references). It’s also approximately ¼ the length of the average chapter in Harry Potter and the Philosopher’s Stone (I find a way to connect Harry Potter to most things in my life) (1). Due to the length, I have decided to post this information in two installments, here is part 2. Don’t let any of that deter you from continuing to read, because the subject matter covered in this post is very important! Superbug – the latest hero from Krypton? A term that has been used recently in the media is “superbug” – but what does it mean? Superbugs are bacteria that have become resistant to several antibiotics used in their treatment (11). A prime example of a superbug is Staphylococcus aureus, which has shown resistance to a number of antibiotics including rifampin, ciprofloxacin, tetracycline and β-lactams (11). You may have heard of methicillin-resistant Staphylococcus aureus or MRSA. This strain of bacteria is most often associated with hospital-acquired infections. The incidence of MRSA in Canadian hospitals alone increased 17-fold between 1995 and 2006 (12). Infection control practices can help reduce the spread of MRSA; however, treatment upon infection can be difficult. What are the impacts of antibiotic resistance? Antibiotic-resistant strains of bacteria can lead to longer hospitalizations, longer treatment regimens and increased side-effects from the use of multiple and more powerful medications. This places an enormous burden on healthcare systems, using significant human and economic resources (13). The direct economic costs in Canada are estimated at $1 billion annually (12). Antibiotic resistant bacteria are responsible for approximately 25,000 deaths in Europe, 23,000 in the USA, and 8,500-12,000 in Canada annually (12,14). Estimates are less readily available for low-middle income countries, but Laximnarayan et al. assume that antibiotic resistance may have an even greater burden in these areas due to a lack of antibiotic regulation and increased burden of infectious disease (14). So, what can you, as a member of the general public, do to help? First of all, and you’ve been told this since you were in kindergarten, WASH YOUR HANDS. Hand-washing prevents infections from spreading in the first place, which in turn should decrease the amount of antibiotics that need to be prescribed. Never share antibiotics with others, or use left-over antibiotics. Left-over or shared antibiotics may not be as effective against the particular bacterial infection your body is trying to fend off. Take your full prescription in order to avoid having to repeat treatment (15). These all seem like simple things, but they really can make a difference! Hope you enjoyed that essay of a blog post. As always, check out our Facebook, Twitter, Instagram and Website for information on what we here at the Global Health Office do, and all of our exciting upcoming events! (1) Better Novel Project. Playing the Numbers: Basic Word Counts. 2013. Available from: http://www.betternovelproject.com/blog/word-counts/. (2) World Health Organization. World Antibiotic Awareness Week. 2015. Available from: http://www.who.int/mediacentre/events/2015/world-antibiotic-awareness-week/event/en/. (3) World Health Organization. Quiz: How much do you know about antibiotic resistance? 2015. Available from: http://who.int/mediacentre/events/2015/world-antibiotic-awareness-week/quiz/en/. (4) McDonell Norms Group. Antibiotic overuse: the influence of social norms. J Am Coll Surg 2008;207(2):265-275. (5) Gandra S, Barter DM, Laxminarayan R. Economic burden of antibiotic resistance: how much do we really know? Clin Microbiol Infec 2014;20(1):973-980. (6) Scott G. Antibiotic resistance. Medicine 2009;37(10):551-556. (8) MeMed. The Resistant Bacteria Problem. 2015. Available from: http://www.me-med.com/html5/?_id=11489&did=2466&g=11051&title=the%20resistant%20bacteria%20problem. (9) Marshall BM, Levy SB. Food animals and antimicrobials: impacts on human health. Clin Microbiol Rev 2011;24(4):718-733. (10) Knobler SL, Lemon SM, Najafi M, Burroughs T. The Resistance Phenomenon in Microbes and Infectious Disease Vectors: Implications for Human Health and Strategies for Contrainment – Workshop Summary. The National Academic Press. 2003. (11) Canadian Antimicrobial Resistance Alliance. Comprehensive Overview of Antibiotic Resistance in Canada. 2007. Available from: http://www.can-r.com/mediaResources/ComprehensiveOverview.pdf. (12) Canadian Union of Public Employees. Healthcare Associated Infections: A Backgrounder. 2009. Available from: http://cupe.ca/sites/cupe/files/healthcare-associated-infections-cupe-backgrounder.pdf. (13) Health Canada. Impacts of Antibiotic Resistance. 2014. Available from: http://healthycanadians.gc.ca/drugs-products-medicaments-produits/buying-using-achat-utilisation/antibiotic-resistance-antibiotique/impacts-repercussions-eng.php. (14) Laxminarayan R, Duse A, Wattal C, Zaidi AKM, Wertheim HFL, Sumpradt N, Vlieghe E, et al. Antibiotic resistance – the need for global solutions. Lancet Infect Dis 2013;13(12):1057-1098. (15) World Health Organization. Antibiotic Resistance: Fact Sheet. 2015. Available from: http://www.who.int/mediacentre/factsheets/antibiotic-resistance/en/. This week, the Global Health Office blog is going to get real scientific. So scientific, in fact, that I feel like I’m writing a paper for class (there are even references). It’s also approximately ¼ the length of the average chapter in Harry Potter and the Philosopher’s Stone (I find a way to connect Harry Potter to most things in my life) (1). Due to the length, I have decided to post this information in two installments, here is part 1. Don’t let any of that deter you from continuing to read, because the subject matter covered in this post is very important! Monday November 16th marked the first day of the very first WHO Antibiotic Awareness week, which continues until November 22nd. 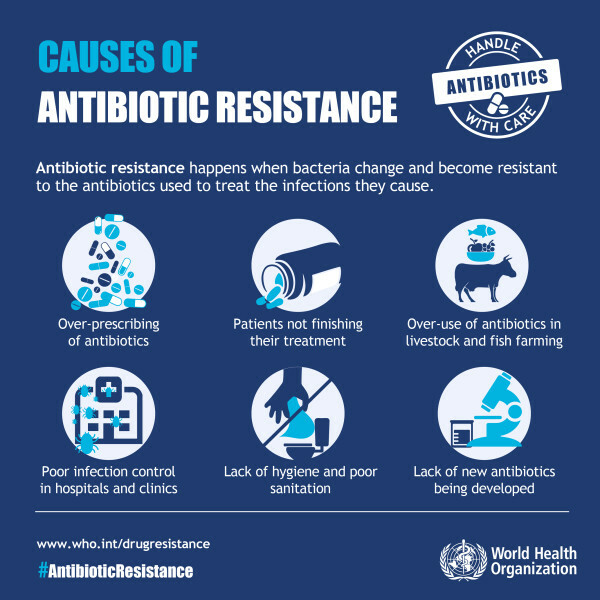 This is part of a global action plan to address the growing problem of antibiotic resistance devised at the World Health Assembly in May 2015 through education, communication and training (2). Want to test your knowledge before reading the rest of this post? WHO has put together a quick, 6-question online quiz that touches on the basics of antibiotic resistance, which you can find here (3). If you got less than 6/6, good effort! But, you should keep reading because there is some useful information contained in this post that will help you get a perfect score in future. If you got 6/6 – congratulations! However, you should also keep reading because there is plenty of information not covered in the quiz that we have included here (also because it took me most of the work day to write this). What are antibiotics, and how does antibiotic resistance occur and spread? Antibiotics are used to treat bacterial infections (i.e. urinary tract infections, pneumonia, etc.). They are essentially useless against viral infections (i.e. influenza) or fungal infections (i.e. ringworm). It is important to understand that the bacteria, not humans or animals, become resistant to antibiotics (4). Antibiotic resistance occurs when bacteria evolve, adapt and become resistant to the effects of antibiotics used to treat the infections they cause. This can happen through (a) genetic mutation or (b) acquiring resistance from another bacterium. Genetic mutation is a natural, spontaneous process (occurring at a rate of 10-6 to 10-9, depending on the bacteria); however, misuse and overuse of antibiotics in humans and livestock is only accelerating its course (5,6). For example, a survey conducted by WHO found that of 9,772 respondents from 12 countries, 32% thought they should stop taking antibiotics once they felt better, even if they had not yet completed the full course of treatment (7). Shortening the recommended treatment regimen may not kill all of the infection-causing bacteria, which can lead to the need to re-initiate treatment later. Overusing antibiotics kills susceptible bacteria, but selectively allows more resilient, antibiotic-resistant bacteria to survive and multiply in an environment with less competition. This process is called selective pressure, and is depicted in the infographic below (8). Antibiotic-resistant bacteria can go on to spread from person to person through direct contact, or contact with a surface that has touched a person with an antibiotic-resistant infection. Furthermore, resistant bacteria can be spread from livestock, food or water to humans, due to the extensive use of antibiotics in the agricultural industry. Low-dose application of antibiotics in a large number of animals augments the “selection density” of the antibiotic (9). This means that even though resistance occurs naturally at a certain rate, using more and more antibiotics can shorten the amount of overall time it takes for drug resistant bacteria to appear. This is very similar to antibiotic overuse in humans, except for the fact that in livestock, antibiotics are not always used therapeutically to treat disease. Antibiotics are also used for a wide variety of nontherapeutic purposes including growth promotion, contributing significantly to resistance (9). A number of other factors are contributing to the growing antibiotic resistance, including: overprescription, access to antibiotics without a prescription and poor hygiene and infection control practices (10). Antibiotic resistance represents one of the largest threats to global health today, as it can affect anyone, of any age, in any country (7). The lack of effective new antibiotics being developed also worsens the problem, as we are quickly running out of alternative treatment courses for a number of drug-resistant bacteria (10).